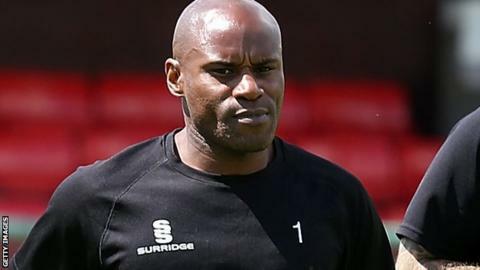 Ex-Chelsea and Leicester defender Frank Sinclair wants to stay on as Hednesford Town manager next season, even if they go down from National League North. Despite beating Tamworth 2-1 on Saturday, the Pitmen are six points from safety with just four games left. They also have an inferior goal difference to the two teams above them, but Sinclair is remaining positive. "I want to stay. The project I talked about with the chairman was beyond this season," Sinclair, 44, told BBC Sport. "We will probably have to win all of our remaining games to stay up but we will keep going while it's still possible. "All sorts of things can happen at this level - financial issues, points deductions - so we have to give ourselves every chance. "The players are still playing for survival but, whatever happens, they are playing for their pride and their futures too." Hednesford, in 21st, have the chance to put pressure on their rivals when they host Worcester City on Tuesday, before a visit to leaders Solihull Moors on Saturday. If second-placed North Ferriby United fail to win at Stalybridge on Tuesday, Solihull would be champions. Former Jamaica international Sinclair is Hednesford's third manager this season, having taken over in December following the sacking of Bernard McNally after only three months in charge. Ex-West Bromwich Albion, Shrewsbury and Northern Ireland midfielder McNally took over when Rob Smith left Keys Park to rejoin Telford in August. Sinclair briefly left in March, but Hednesford chairman Steve Price said that he should not have accepted Sinclair's resignation and asked him to reconsider. They have lost just twice in six matches since then, with former Chester striker Tom Peers' two goals helping them come from behind to beat promotion-chasing Tamworth for their first win since 26 January.